It was the World Beer Festival for Clipper City Brewing and me this past weekend: 6000 attendees, over 150 breweries, and beautiful weather, in downtown Moore Square in Raleigh, North Carolina. 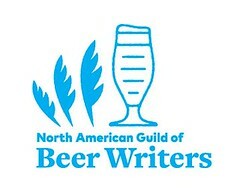 It's presented twice a year - in Raleigh in the spring and in Durham in October - by husband and wife Daniel and Julie Bradford and their publication, All About Beer. When I work a festival, I'm attempting to increase the visibility of my brewery. That means, that except for potty breaks, a quick nosh, and some visits to friends and fellow brewers, I root myself to my booth to better answer the questions of thirsty festival goers. Quite a few beer-loving (and often happily indulging) folk do eventually visit my table. At this World Beer Festival, Clipper City Brewing had two specific goals. First was to serve our Loose Cannon Hop3 Ale, pulled fresh from a firkin cask. Second was to have our table placed adjacent to that of Cabot Cheese. Festival co-organizer Julie Bradford was presenting two talks on pairing beer and food. Clipper City offered a complement to that - but in the beer tents. 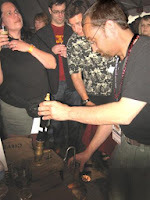 Anyone who waited to get his 2 ounce pour of Loose Cannon at our table could not fail to see the beer and cheese poster which sat just to the right of the handpull. And anyone at the Cabot Cheese table could easily help themselves to our brochures: Clipper City paired with Cabot Cheese. Loose Cannon Hop3 Ale - herbal, fruity, aromatic - was a popular and piquant mate for the sweet basil and tomato basil blended into Cabot's Tomato Basil Cheddar. We made many converts to the tandem splendor of beer and cheese. Our first goal - serving Loose Cannon Hop3 Ale from a cask - was a draining, so to speak, success! We brought 2 casks - firkins (the traditional name for a cask of 9 UK gallons, that is, 10.8 US gallons) of still fermenting Loose Cannon. The festival is divided into two sessions. 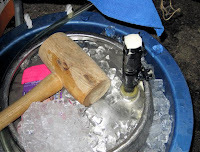 I served one firkin for each session. An hour and 15 minutes was the longest either firkin survived! 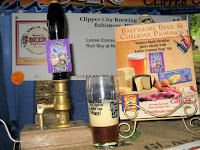 Clipper City was the only booth serving real ale. With that many people drinking so many other beers, it was remarkable to watch them stand there, sipping their 2 ounces from our cask, listening to my riffs (albeit abbreviated for the controlled pandemonium) on real ale. My voice was raspy by the conclusion of the first session. 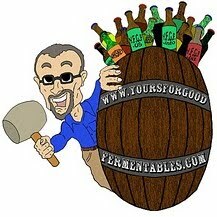 As soon as a brewer racks his beer into bottle or keg, the beer is dying. Good brewers can forestall this, but it's our reality. Cask ale, however, is living beer. No pumps, hoses, lines, filters - nothing - comes into contact with the beer. It is racked into the casks - still fermenting. It sits there for a week - and then I hammer in the tap. It's the freshest any ale can be. And the difference in taste is remarkable - such as between a fresh-baked loaf of bread straight out of the oven and that same loaf weeks later! After one such oration, I heard "Preach on brother!" I looked up and saw brewer Kevin Kozak, laughing. Kevin had been the final brewer at Thoroughbreds Brewpub in Leesburg, Virginia, before it was closed and sold. It would be months before the new owners reopened the brewpub as Vintage 50. New brewer Bill Madden continued to serve Kevin's beers until Bill's were ready. So, I laughed in return: all that flew in the face of what I was saying about cask ale. But, well-made beers will show well when brewed and packaged by a talented brewer. Kevin now brews for Front Street Brewery of Wilmington in North Carolina. His talent will make a visit there de riguer upon my return to the state!